Welcome to my page, dedicated to John Wetton, an extremely talented musician with the most incredible singing voice to ever exist (IMHO:) ). He's probably best known as the ex-lead singer of Asia, and he's also been in many other bands, including U.K., King Crimson, Uriah Heep, and Roxy Music. He's also done some amazing solo albums, the latest of which is Arkangel (only available in Japanese or European import versions right now). Well, since almost half the people who have been to this page in the past few days didn't make it to the picture page, I've decided to finally update this page and keep it short this time:). The main attraction of this page is the pictures I took 5/27/97 when I had the opportunity to see him live at the Bottom Line in NYC (it was the first time I'd seen him in about 14 years!). I also got to meet him, and he's a really nice, friendly guy. I saw him again, and got more pictures, but with my schedule being so busy I never got a chance to scan them in:(. Now that I'm working on my web pages again I hope to fix that soon. Meanwhile, I've fixed up the formatting on the pictures I do have and made the thumbnails a little bigger. (I was going to fix them up, but Photoshop doesn't seem to like the jpegs, so I might have to rescan them.) 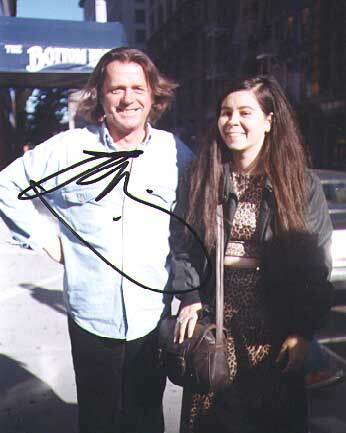 And I just scanned in the autographed copy of the picture of me with him and added it to this page.